We provide International Powered Access Federation or IPAF training on how to use powered access safely and effectively. IPAF training courses run daily at the Nottingham training centre. Contact the Nottingham training centre to book you course. IPAF Mobile Elevator Work Platform (MEWP) training is the most established access programme. 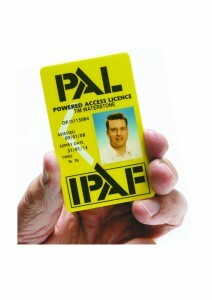 The IPAF PAL card will beawarded upon completion of the training. This confirms the identity of the bearer and which category of MEWP they are qualified to operate. IPAF training is an essential element of Health and Safety training. Employees failing to hold the required powered access training is the reason why one in five building sites fail Government Health and Safety Inspections. We can provide all the necessary training to ensure your company is both safe and legal and avoid the unnecessary expense and upset of having your operation put on hold due to high incidence of accidents or failure to comply with H&S regulations. • MEWPs for Managers (MM). This means that the operator has successfully completed the PAL+ course, which covers additional, practical training and testing on the machine category indicated. The operator has successfully demonstrated his/her ability to operate powered access equipment safely and effectively in challenging work environments. It is a legal requirement for height workers to have the necessary qualification to prove they can operate elevating work platforms effectively and safely. The PAL card is a Powered Access Licence proving that the worker is suitably qualified and can be allowed on site – if you can’t provide proof of your training you won’t be allowed on! By completing your training with us you will be issued with a PAL card clearly stating your identity and the level of MEWP training you have completed. You can update and complete additional training at any time, all of which will be added to your card, ensuring you are always carrying the correct professional documentation with you at all times. 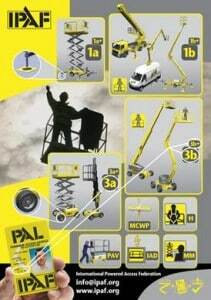 Please contact us for more information on our complete range of IPAF training.